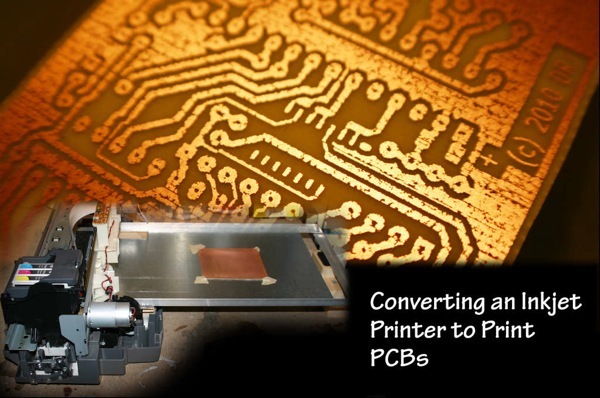 Converting an Inkjet Printer to Print PCBs « Adafruit Industries – Makers, hackers, artists, designers and engineers! I really enjoy reading the Adafruit blog and thought my project would fit in perfectly. I’ve created an Instructable that follows my entire build process as I took a stock Epson C86 inkjet printer and modified it to print on copper clad board. Using this printer and a specialized ink I am able to simply print out boards and etch them. While this project has been done before I’ve yet to see a source where the modification is completely documented in a step-by-step fashion.